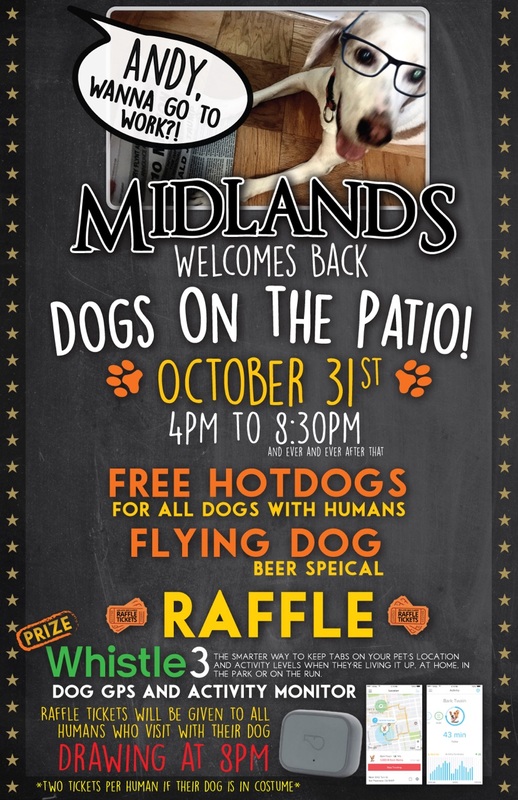 The Midlands Hosting Welcome Back Dogs Halloween Party Tomorrow | Park View, D.C.
To celebrate the return of dogs back to the patio of The Midlands, they are having a celebration on Halloween to commemorate the occasion. Below is the announcement from their Facebook page. Mayor Bowser signed the dog legislation! Dogs are welcome back to our patio and we’re celebrating on Oct 31st! Free hotdogs for all dog’s with humans, a Flying Dog Brewery Beer Special and a raffle to win a Whistle3 Dog GPS & Activity Monitor! Tickets will be given to all humans who visit between 4P and 8P with their dog. Humans who are with dogs in costumes will get 2 tickets!! Dogs may bring as many humans as they like. This entry was posted on October 30, 2017 at 7:01 am and is filed under Bars, Development. You can subscribe via RSS 2.0 feed to this post's comments. Right, because in the dog-owning Millenials – kids-raising families rift that the Midlands has managed to create, dog-owners don’t want to be home and deal with handing out candy to kids.